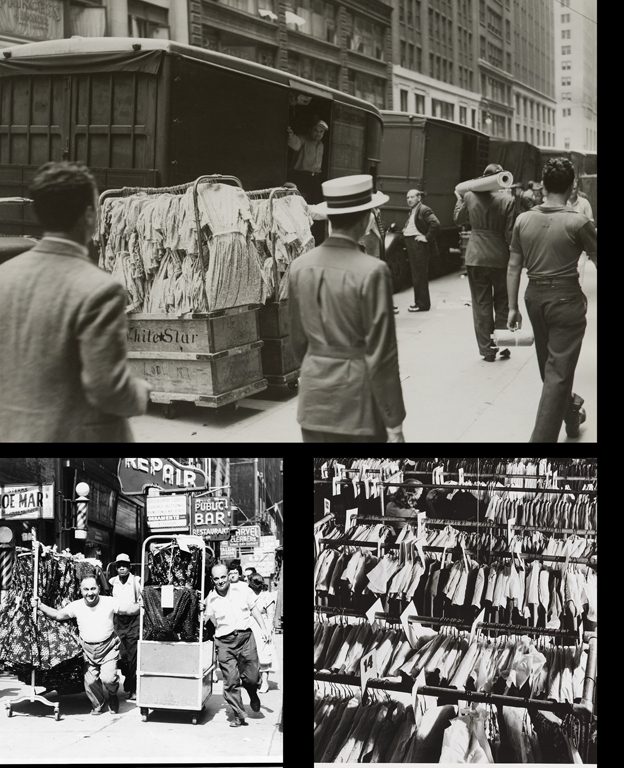 Top: Garment Center Street Scene, 1938. NYC Department of Records, Municipal Archives. Bottom left: "Men pulling racks of clothing on busy sidewalk in Garment District, New York City," 1955. Library of Congress. Bottom right: US Office of War Information. Stockroom of clothing manufacturer, 1944. Courtesy of Museum of the City of New York. The structure of the ladies' garment industry in New York is extremely complicated. In the early 20th century, many factories were "inside shops"; that is, businesses in which, under one roof, goods were designed, fabricated, marketed, and shipped. These manufacturers often employed large numbers of workers. By the 1920s, however, only a few inside shops survived, generally producing high-end garments. Many of these were located in the Garment Center Capitol. The jobber-contractor system replaced the inside shop. Jobbers controlled production, chose designs and fabrics, sometimes cut the cloth, and marketed a clothing line, but they did not manufacture the garments (although, ironically, they were often called "manufacturers"). The jobbers hired contractors who actually sewed the garments. Each jobber might work with multiple contractors and each contractor sought commissions from as many jobbers as possible. The system was advantageous to the jobbers and benefitted some contractors, but workers generally opposed it since competition for orders among contractors cut profit margins and wages suffered as a result. The structure of the jobber-contractor system also meant that the components of an article of clothing often moved from one building to another. Fabric was delivered to the jobber, where it was either cut or sent directly to one or more contractors; accessories, such as fur cuffs and collars, buttons, bows, and belts came from other factories; finished items returned to the jobber to be stored in stockrooms or sent to retail stores. This complex of multiple interconnected, but separate units explains the congestion on the district's streets. Trucks lined every curb, and mobile racks and carts were pulled through the streets, moving items between the various involved in design, production, and sales.